When the leaves turn in autumn, Zionsville is as colorful and beautiful as any community in the country. It’s no surprise then that the community has a rich history of fall events. The Lion’s Club recently presented its 62nd annual Fall Festival, but that is just one of the top fall events in Zionsville. 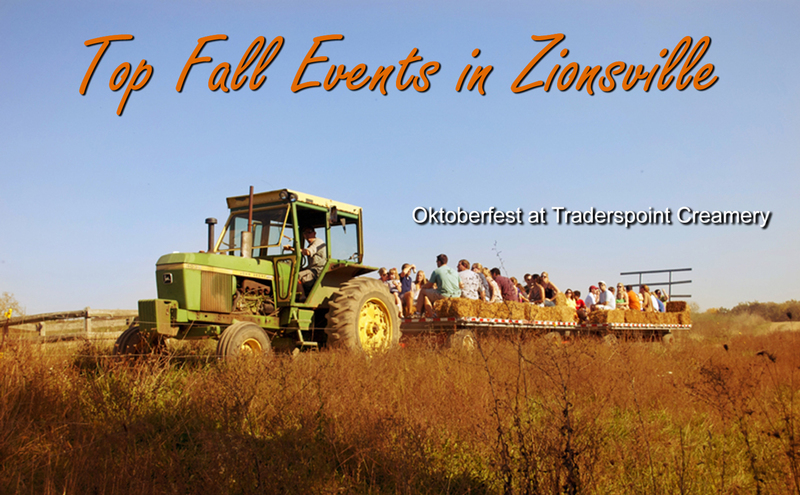 Below are some of the top fall events in Zionsville for 2015. If you like to take road trips to view the kaleidoscope of autumn leaves around the state, we’ve also included a handful of events in other Indiana communities. For a comprehensive listing of events in Zionsville, visit the Town Planner calendar. For Zionsville business events and other local activities, visit the Zionsville Chamber of Commerce’s Community Events listings. Ghost Walk in Zionsville – 6:30pm-9:30pm – Haunted walking tour of Zionsville leave every 15 minutes from SullivanMunce Cultural Center. Visit website. Oktoberfest at Traderspoint Creamery – Noon-7pm – Dust off your lederhosen and come celebrate Oktoberfest on the farm in the German tradition! There’s food, music, and fun for the whole family. Visit website. Josiah’s Ride: Cruzin’ 4 a Cure at the Zionsville American Legion – 9am-7pm – Join the Zionsville American Legion Riders for family friendly fun, food, music and a motorcycle charity ride at the 9th Annual Josiah’s Ride: Cruzin’ 4 a Cure benefit and help local children who has been diagnosed with Leukemia or Lymphoma. Visit website. Harvest Festival, Delphi, IN – 9am-7pm – Pie Contest & Pie Auction. Visit website. Gathering at Five Medals – Goshen, IN – 9am-5pm Sat & 9am-4pm Sun – River Preserve County Park – Where your Indiana history comes alive! Step back in time at this wonderful and unique living history event located a couple of hours up the road – perfect for an overnight getaway. Gathering at Five Medals lets you experience Northern Indiana as it existed more than 300 years ago. Visit website. Fort Vallonia Days Pioneer Festival – Vallonia, IN – 9am-6pm Sat & 9am-5pm Sun – For over 45 year, this colorful festival has always been on the third weekend in October – and worth the ride. The festivities are in honor of the fort built around 1810 at the direction of the Govenor of Indiana, Gen. William Henry Harrison. Watch local people in action making apple butter, braiding rugs, spinning, and quilting. Enjoy trail riding, muzzle loading shoot, tomahawk and knife throw, horseshoe pitch, 5K run/walk, baking contest, free entertainment, homemade food, teepees, and much, much more! Visit website. Tyke Hike: Leaf Walk at Zionsville Nature Center – 10am-11am – This is a FREE event for ages 3 – 6 years with an adult. Hey tykes! Grab your parents and us we hike and explore nature in our backyard. Discover the shapes and colors of fall leaves with activities and a craft. Visit website. 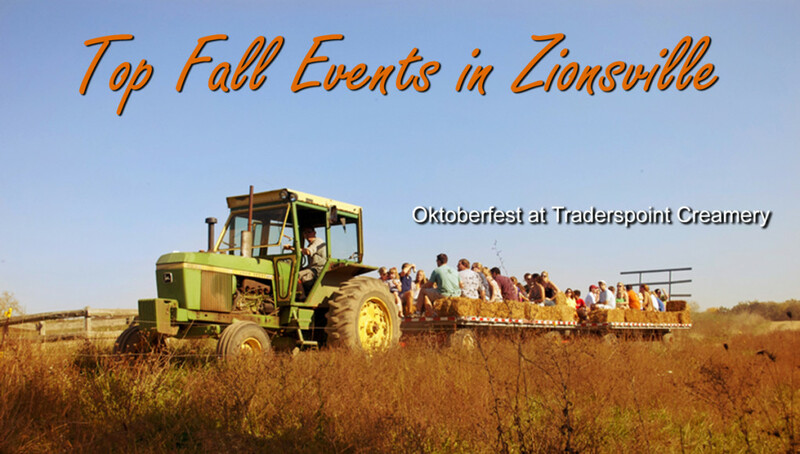 Pumpkins and Hayrides at Zionsville Lions Park – 2pm-5pm – This is a FREE event. There will be pumpkin painting, hayrides, bounce houses, games, food, and more! Kids can participate in a costume contest as well! Visit website. Haunted Trails and Trick Or Treat Trail at Cool Creek Park in Carmel – 7pm-9pm – Make your way through the “boo-tiful” woods of Cool Creek Park for our annual Haunted Trails Halloween event! Ghouls and goblins are lurking at every turn and waiting for you to arrive. Trail not recommended for kids under 12, but there will be lots of non-scary activities for the little ones in the Trick-or-Treat Trail – a campfire, free hayrides and more! Visit website. Annual Boone Village Halloween Party – 5:30pm-7pm – This is a FREE event. Safe Trick or Treating. Games and more! Zionsville High School Jazz Band to perform at 5:20pm. Costume Contest starts at 6pm. Back again this year is the “Kid’s Imaginative Design Award” to the kid with the best created and original costume using his or her own imagination and materials. Visit website. Irvington Halloween Festival Street Fair – 5:30pm-7pm – This is an annual (free!) event that concludes the 3-week Irvington Halloween Festival. (Full schedule of events.) The final-day Street Fair provides entertainment, food, and 200+ vendors throughout Irvington. Visit website. 39th Indy International Festival at Indiana State Fairgrounds – 10am-9pm – This 3-day festival is not specific to autumn, but it is a great way to travel around the globe without leaving the area. Features exhibits from the 60 + ethnic groups represented in Central Indiana as they gather to share their rich cultural histories and traditions. Highlights include authentic foods from 20+ ethnic vendors; continuous ethnic music and dance by local and national performing groups; Culture Booths hosted by volunteers in traditional dress where you can connect with your own ethnic heritage; artisans demonstrating unique cultural crafts; a Naturalization Ceremony and an International Marketplace offering gifts from around the world. Visit website. Festival of Trees at Lanthier Winery in Historic Madison, IN – 11am-5pm – If you’re in Southern Indiana (near Louisville) during the holidays, you really should see the nation’s largest and most stunning holiday displays. Free admission to this magic forest of shimmer and shine, glimmer and gold. More than 105 magnificent trees greet visitors – and each year the forest changes – no two trees are alike. The Festival of Trees is an annual favorite of visitors across the nation. Visit website. Christmas in the Village Parade, Tree Lighting–and Much More! – 1:00pm-7pm – Zionsville’s annual Christmas in the Village Parade and Tree Lighting is a heartwarming local tradition that marks the transition from fall to winter. Visit website. Christmas on the Farm at Traderspoint Creamery – Noon-7pm – This is a holiday extravaganza for the whole family! Visit with Old St. Nick himself and enjoy festive farm fare at Brunch with Santa at The Loft Restaurant, decked out in its holiday greenery. Sip grassfed Eggnog and creamy Hot Chocolate. Then head to the Red Barn for live holiday music and crafts! Visit website. If the event you really want to participate in this fall is picking a pumpkin, here are a few links that should help you find a patch where you can pursue your pleasure. The Pumpkinfest at the Country Market in Zionsville – 10am-6pm Saturdays / 10am-6pm Sundays – fall farm activities like hayrides, corn maze, farm animals, face painting, decorate pumkins, 100-foot slide. Entertaining blue grass music. Tasty fresh apple-cinnamon donuts, hand-breaded tenderloins, and hot kettle corn. Largest selection of pumpkins, gourds, squash, Indian corn and giant pumpkins in Central Indiana! Visit website. Who’s Looking for a Pumpkin Patch? – Various Times – The Town Planner has comprised a list of locals farms and orchards where you can dig in the dirt and pick your pumpkin fresh off the vine. Visit website.